Day 3 started early (well, actually not that early, heh!) as we start off with a 2 hours' drive down to Sairo Observatory at Lake Toya! And of course, more Mt Rainer coffee to perk us up along the way! 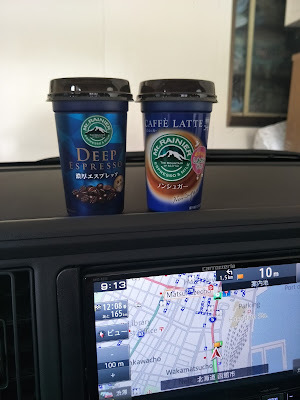 It's listed on various travel sites that entrance to the observatory is 1000 yen per car, but... we didn't find any place for us to make payment, even for car parking. So it became FREE for us. And then the BF insisted on taking the helicopter ride, which was about SGD $60 per pax for a 3 minutes ride over Lake Toya. Love the point where the pilot (??) made a big turn in order to land the helicopter. So exciting! There's a cafeteria on 2nd floor of Sairo Observatory, but we didn't even bother to check it out to see what kind of food they offer, for we already have Lake Hill Farm on our itinerary! Sairo Observatory is open daily from 9am to 5pm. Lake Hill Farm is just a 4 minutes drive away, and on googlemap it even seems of a walkable distance, however will be entirely on the main road (for cars!) so.... I suggest you do not walk. The choice of food here at the cafe is pretty limited and not the cheapest you can get, but the entire setting of the place was really worth it, I assure you. There's also an ice cream parlour beside the cafe which serves some pretty good soft serve ice creams. We got a cheesecake, a pizza and the milk pie to share. I highly, HIGHLY recommend the milk pie because it's SO GOOD! I'm hardly a fan of custardy filling, but I was totally okay with this because it's considerably lighter and the pie crust so flaky and buttery. And now, this is why the limited (not the most budget food) is actually worth their price tag. Right behind the cafe is a vast patch of non-ending grassland, and you can find animals such as donkeys, rabbits and a goat (named Yuki!). "Rabbit's Carrot - 100 Yen"
Right at a corner of the rabbit's enclosure, is a small box that is tagged: Rabbit's Carrots - 100 Yen. Just drop your 100 yen into the box and grab yourself a pack of the sliced carrots to feed these little critters! And we actually fed a few to Yuki the goat as well. I hope it's alright for goats to eat carrots? If being near animals is not your thing, then perhaps you can get yourself some toy sports equipment placed at the front of the grass patch. There's some soccer balls, badminton rackets and shuttlecocks, softball with that I-dunno-what-you-call-them racket kind of thing for you to play throw/catch with. The entire place was just so peaceful and chillax that we did overshoot our time of stay for a while (playing catch ball and annoying Yuki the goat). 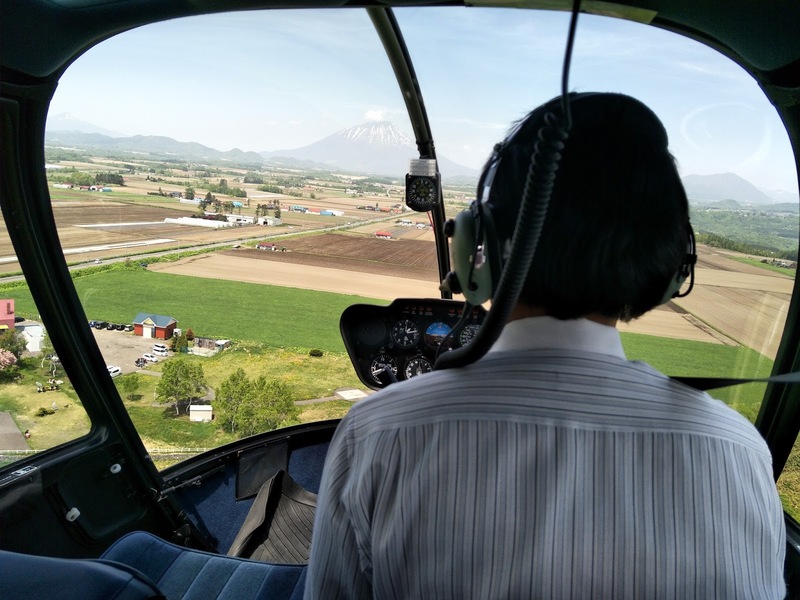 Lake Hill Farm is located at 127 Hanawa, Abuta-gun, Toyako-cho 049-5724, Hokkaido and is open daily from 9am to 6pm. After bidding Lake Hill Farm goodbye, we headed for Toyako Visitor Centre, which is about 10 to 15 minutes drive away. There's a volcano science museum here, with an admission fee of 600 yen per pax, but we're not here for that. It's the volcano crater walking trail (kompirayama walking trail) we're here for, and it's FREE! 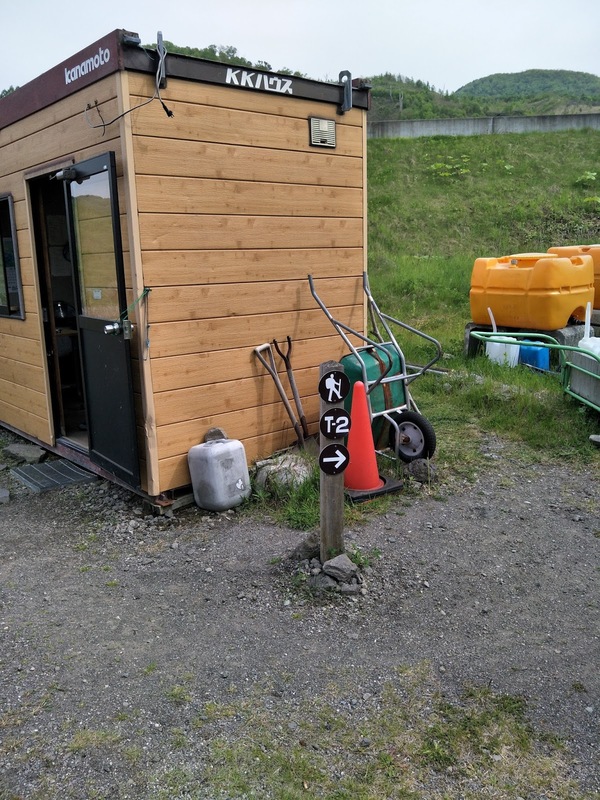 The Kompirayama Walking Trail starts at the Toyako Visitor Center in Toyako Onsen and leads to the Nishiyama parking lot. Along the way, you can see various ruins, including a destroyed public bath house, apartment block and bridge. The trail also passes two of the largest craters from the 2000 eruption, as well as large erosion control dams. It takes about 40 minutes to complete the walk. From the Nishiyama parking lot, the Nishiyama Crater Walking Trail leads to some more of the newly created craters around Mount Nishiyama. Several destroyed buildings, disrupted roads and broken phone poles have been left untouched for visitors to witness the destructive power of the volcano. It is about a ten minute walk from the parking lot to the craters and a further ten minute walk to the trail's southern end, where the ruins of a kindergarten and a second parking lot are located. No worries about being lost along the trail at all, for there's markers set up along the way to guide you along, that tally to the map. Love, love, LURVEEEE this part of our itinerary at Toyako because there's absolutely NO OTHER TOURISTS along the trail with us. 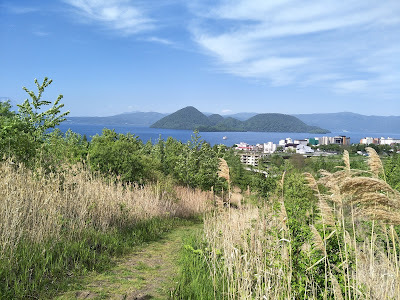 Not sure if it's because end May early June is the super off-peak season or more because this volcano crater walking trail is more "off-the-grid" or just not at all popular with tourists. In fact, the entire area felt totally DESERTED, public buses empty, roads empty, and barely just a few cars parked in the car park. 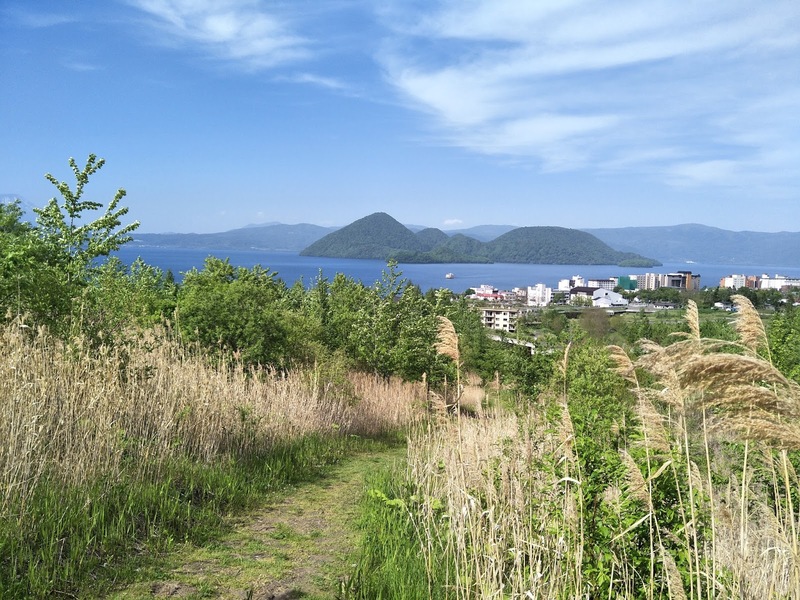 About 15 to 20 minutes into the trail should get you to a spot with a pretty good view over Lake Toya. And then going further on will get you to two water-filled volcano craters. This is the bigger one that looks like a pretty big pond, while the other one (which you will come across first on the trail and slightly blocked by tall grass) will be significantly smaller and resembles more like a small water body. Even though Japan Guide stated the walking trail to take us only about 40 minutes, we actually took about 1.5 hours in total to get back to our car (Toyako visitor centre). Perhaps we've spent too much time camwhoring along the way? Or the hiking testers (if there's just a job position) are just 10x fitter than your average city-people like yours truly, I can't be sure. Anyway, there's actually a bus service which you can take from the Nishiyama parking lot (end of the Kompirayama Walking Trail) back to the Toyako Visitor Centre, which should probably take you only 5 minutes, but because the bus comes every HOUR, it's actually more sensible to just walk back (another 20 to 25 minutes walk) should you miss the bus timing. And yeah, this is some seriously artistic shot of me, right? And can't be sure why the u-bend in the pole, but I guess it's to make space for whatever equipment the firefighters have to install onto the hydrant. And so, by the time we're back at the car, it's almost 430pm and with our rental car return time at 7pm in Sapporo (which is a good 2 hours drive away), it was a mad rush down to our hotel APA Hotel Sapporo Susukino Ekimae for check in and then over to Budget Car Sapporo branch to return the car. Due to the mad, mad rush, I actually didn't (forgot to!) take ANY picture of APA Hotel, but for the listed price on various booking websites, which was about $60 SGD per night, I would highly recommend this. Though without a car park within the hotel, there is actually a public car park nearby, albeit the parking fees aren't exactly cheap. 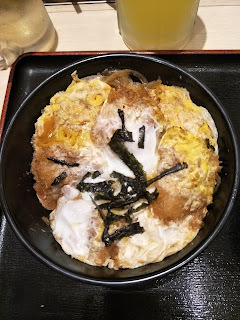 There's a family mart located right at a corner of the hotel lobby as well, and the rooms are clean, cosy and well equipped with all the necessities, even pyjamas (yukata). There's actually TONS of APA Hotel around Sapporo area and you got to choose the one with location that's best suited to your itinerary. This APA Hotel Sapporo Susukino Ekimae is located right beside Exit 3 of Hosuisusukino Station. 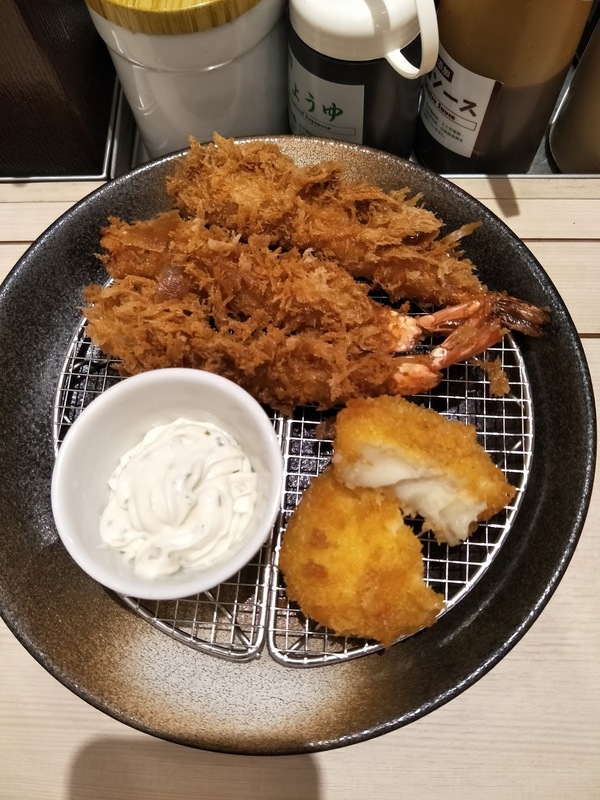 It's also within walking distance to the Tanukikoji shopping arcade (a 5 to 10 minutes walk) and even to Odori/Sapporo Station (20 to 25 minutes walk) and all the attractions around the area. Dinner place for the night was planned to be around Akarenga Terrace, supposedly a nice place for a night's stroll and some good food. However, other than the fact that the building is made out of red bricks, which you won't be able to fully appreciate at night, there's really nothing much fancy about this building and there's nothing fantastic in sight to make this area a good place for a night's stroll. Food choices here are more of the "upper-class" expensive kind and nothing authentically Japanese, so we ditched the idea and randomly roamed around the area instead. And Day 4 in Sapporo is already up HERE, do check it out! Wow! I wanna go to Sapporo! It's on my list. Love the idea of the helicopter ride! Awesome experience. With CarRental8 you can get affordable car rental from over 50,000 locations globally.